You have a lot of calls on your time and on your travel funding (if, indeed, you have any travel funding). That’s why we’re packing the MLA Annual Convention with things you can’t get anywhere else—to make it worth your while to come, learn, and connect. We’re increasing the professional development opportunities for people at every stage of their careers, and we’re encouraging connections between fields that might never connect in other venues. Here’s a quick sketch of three sessions I attended this year, sessions that couldn’t have happened anywhere else. Photo by Edward Savaria, Jr.
First, I moderated a session that was open to the public and focused on fan culture and reader communities. It brought together a venerable scholar in the field who shared her work on ’90s girls’ zines, a mid-career scholar who works on the Harlem Renaissance, and an early-career scholar whose work on podcasts is pushing the field to reexamine peer-review practices. Chatter afterward was all about the rich overlaps among the three presentations, even though none of the presenters had previously met. Next, I went to the Humanities in Five sessions. Anne Ruggles Gere, the 2018 president of the MLA, encouraged us as humanists to make clear the substance and value of our work to folks outside higher education. She put together two sessions that asked scholars to present their research to a public audience in a strictly timed, five-minute format. One session even had judges, from the Chicago media scene. The press was excited about the presentations, and so was the audience—excited about taking our work outside our own walls to show why the humanities matter. The final session I attended was in my field. The session featured lightning talks on the state of Victorian studies in relation to critical race theory. Not all the presenters were purely Victorianists, so they might not have attended a Victorian studies conference; the MLA was an opportunity to bring them together. The panelists gave original yet overlapping presentations that pumped up the audience and each other. I left the room thrilled about the future of Victorian studies. Another significant thing that happened at the convention: the Delegate Assembly, the roughly three-hundred-person body that represents you in the governance structure of the association, tackled the issue of graduate student advising and mentoring. It reached out to members before the convention to collect lists of concerns and presented those at the assembly. Then the Delegate Assembly Organizing Committee broke the huge assembly into small groups (small groups!) and had them tackle a list of questions designed to lead to recommendations for action by the association to improve the conditions of graduate study in our disciplines. And it worked. Delegates shared good stories and bad and made recommendations for policy and guidelines. People left the Delegate Assembly having had discussions and made connections they’d never had or made before at the convention. As a result, the association is creating new guidelines for graduate advising. The MLA Annual Convention brings together researchers and teachers in your field with those from all other fields in languages and literature, writing studies, and cultural studies. Its attendees help determine the direction of the entire profession. Come to Seattle next year. And to as many MLA conventions as you can. We promise to make it worthwhile for you. In the earliest days of the Modern Language Association, the focus of the convention and the association’s publications was members’ scholarly research. That remains, of course, at the heart of what we do. Advanced study in language, literature, writing, and cultural studies links our members across disciplinary specialization, genre, and historical period. But we have never been exclusively a scholarly association; the MLA has always also been a professional association. The pedagogical insights in the Approaches to Teaching volumes have for many years complemented the extraordinary scholarship in PMLA, because most of us teach as well as research and write. Profession speaks to our members in their various roles as teachers, administrators, and higher education professionals. The MLA Action Network addresses us as scholars who want to make change: to provide our administrations with resources to create better conditions for contingent faculty members, to help graduate students from Puerto Rico who want to keep up with their studies, or to lobby for state funding for higher education. When you think of your professional self, what does that include? Teacher, scholar, writer, administrator? How does your professional self overlap with your self in your community? Do you bring your reader self to your news consumption, your writer self to activism or cultural work or the PTA? Your humanities training does not shut off when you leave the classroom or the archive. It informs your sense of the world beyond the text, or perhaps it makes the world a text. We believe that humanities education makes it easier to see nuance, to smell when things are rotten, to hear the differences between lies and truth. And this is why we think it’s worth promoting the value of studying the humanities, at all levels. We want our students to understand language and literature as a way to understand the world; we want them to value writing and performance and film and to understand how the skills and knowledge we get through the study of the humanities make us better readers, better consumers, better citizens, and, yes, better workers. It’s not our business to prepare undergraduates for particular jobs. Instead, what we teach them prepares them for careers, for lives after graduation in which they can put to use the subject area knowledge, the skills, and the values they learn in humanities classes. Humanities education prepares students to contribute to their communities, families, and workplaces, and as professional humanists we can approach that work from at least two sides. We can help our students become articulate about what their education has given them, and we can help those outside the university understand better the value of both undergraduate humanities education and advanced work in the humanities. We can, in short, become ambassadors for the humanities. This year’s convention invites you to do just that. It will include an OpEd Project workshop, training dozens of attendees to expand their scholarly writing and research skills to write for popular audiences. In addition, we are hosting twenty doctoral students from the United States and Canada who will learn through the Connected Academics project how their degrees are valuable in careers outside academe. Possible Futures, a career fair for new and mid-career professionals, allows convention attendees to talk with employers who respect and appreciate humanities doctorates. 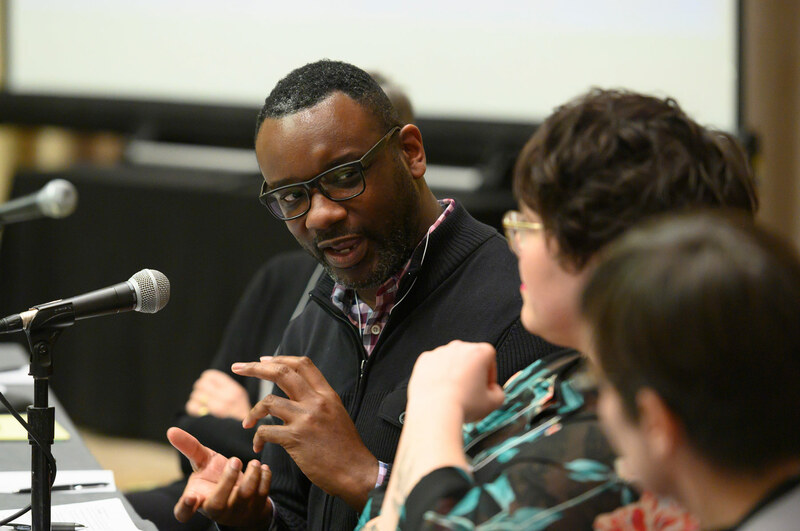 We are offering more convention sessions on pedagogy and on professional development, and we are offering more professional development resources online and in print, for full-time and contingent faculty members and for nonacademic humanists. We are developing programming that helps departments make clear to their majors as well as to their communities and employers the value of humanities degrees. The more we can talk to the world at large about what we do and why we do it, the clearer the value of our work will become. The more clearly we can demonstrate the value of humanities education, the more it will be valued by the public and our policy makers—and the harder it will be to dismiss it, to close language departments, to badmouth area studies degrees, to shed tenured positions in favor of per-course labor. Come to the convention. Learn to advocate for what you do, what you teach, what you study. Write, attend meetings, talk. Today, especially, we all need to be public humanists. We’re excited to welcome the convention back to the MLA’s home city, New York, in 2018. And I’m especially pleased that my first convention as executive director will bring thousands of members to my new home, a city with a vibrant history of literature, art, theater, and cultural and political engagement of all sorts. Engagement—activism, advocacy, and participation in the arts—is an overriding theme in this year’s convention. The presidential theme, #States of Insecurity, calls attention to the role of the arts and humanities in national and international politics, and the convention will offer participants many opportunities to think about and take action to support the arts and humanities. Tables will be scattered throughout the convention hotels, marked by MLA Action Network banners and staffed by volunteers who will help you send your senators and representatives handwritten postcards (which are more effective than e-mail). We’ll have postcards, stamps, and even sample messages for you so that you can convey your support for federal funding for language study, maintaining and strengthening the National Endowment for the Humanities, affirmative action in university admissions, or whatever topics are most important to you. The humanities and arts in this country need public champions, and the MLA is eager to lead, supporting the study of literature, language, writing, and culture and making clear the value of research in our fields. The convention represents all our disciplines and our work, from activist sessions on adjunct labor (e.g., Organizing from the Inside: Effecting Change for Adjuncts in Insecure Times) to pedagogical sessions on the writing classroom (e.g., Ways of Writing in High School and College) to research presentations on the newest approaches to literature and language (e.g., James Baldwin’s Speculative Imaginary; Why Teach Literature? ; New Currents in Medieval Iberian Studies). In keeping with the convention theme, several sessions will focus on advocacy and activism, such as The Humanities and Public Policy and Sanctuary, Contingency, and the Campus as a Site of Struggle. We’ve shifted the focus of the convention over the years and introduced a wide variety of new session formats, including workshops, roundtables, and sessions dedicated to professional development and advocacy. And, of course, job interviews take place at the convention. While the MLA continues to advocate for secure, well-paid teaching positions, we also recognize that tenure-track jobs are not the main employment destination for those of us in MLA fields, and, in fact, they were never the sole destination. Those who study and work on language and literature have always pursued a variety of vocations, such as university and community college teaching, public humanities work, secondary school teaching, public service, and even corporate work. Since 2015, the MLA’s Connected Academics project, funded by the Andrew W. Mellon Foundation, has offered a yearlong career-exploration proseminar for twenty doctoral students from universities in the New York area. We’re looking for ways to make the proseminar available to more doctoral students, and so this year’s convention will feature a Connected Academics boot camp for twenty doctoral students from around the country. During their four days in New York, the boot camp fellows will participate in a series of linked sessions as well as in special group workshops and a behind-the-scenes visit to the New York Public Library. We hope that participants will be enthusiastic ambassadors for humanities careers, taking their experiences and learning back to their home departments to benefit their colleagues. Last year’s convention featured our first Benefit for the Humanities. The proceeds from that event enabled us to expand our advocacy for the humanities and our support for contingent faculty members and graduate students. We have been able to fund workshops with the OpEd Project, which trains subject experts to write op-ed pieces for newspapers; to provide travel grants for graduate students and contingent faculty members and internships for graduate and undergraduate students; and to develop the Connected Academics boot camp, among other projects. If this is the kind of work you believe in, I hope you’ll join us at this year’s benefit on the opening night of the convention. Stay tuned for more information in the MLA news digest. I’m looking forward to seeing you at the 2018 MLA convention in New York City. The letter below was sent to MLA members on 17 August 2017. At times like these we need community. My colleagues at the MLA and I share your revulsion at the horrific events that took place in Virginia last weekend. We share your dismay over much in the public exchange about them. And we share your grief for the students, faculty, and staff at the University of Virginia, the people of Charlottesville, and all victims of the violence and hatred incited by racism and white supremacism. As you address in your classrooms the issues that arise from these events, you have many resources at your disposal, including JSTOR’s “Charlottesville Syllabus: Readings on the History of Hate in America,” a VICE documentary about Charlottesville, and the many materials circulating under the hashtag #CharlottesvilleCurriculum and elsewhere. You may also want to take a look at the essays and resources in Teaching the Literatures of the American Civil War, which we’ve made available as a free download in the MLA bookstore. Please let me know if there are other ways we can support you as you support your students. As I stood near the Hotel Inglaterra on the Parque Central in Havana in early March, I was consciously occupying Guillermo Cabrera Infante’s vantage point as represented by the cover image of La Habana para un infante difunto. It shows a photographer reclining against a lamppost with his old-fashioned camera, ready to snap pictures of tourists and locals, a custom I saw repeated on my visit nearly four decades after Cabrera Infante’s work was published (“Photo, lady?”). My knowledge of Cuba had come through literature, history, art, and scholarly writing, and I was eager to put my feet on Cuban soil now that travel to the country had been eased. Little in my theoretical training prepared me for the lived realities of contemporary Cuba. I expected Havana to be a mix of beautifully restored buildings and crumbling colonial-style ruins, and I was not disappointed. I had not imagined Centro Habana’s stray dogs and cats scavenging for food in the roads, where pedestrians walked because the rubble-filled sidewalks were often impassable. I knew that daily life presented major challenges for Cubans, who have lived with the United States embargo for over half a century and have endured the Special Period following the collapse of the Soviet Union nearly two decades ago. Seeing the store shelves empty of basic goods brought home to me what scarcity means on a daily basis. Watching Cubans compete for my peso convertible—the currency that can purchase household goods, a restaurant meal, or an airline ticket, if authorization to leave the country can be granted—made me feel constantly solicited. Everyone knew that I was a foreigner, even though I speak Spanish fluently and do not look the blond gringa type. People asked, “Where you from, lady?” as I passed by. In situations where I had to give an answer, I didn’t always say “the United States,” mostly because of the legacy of my country’s actions toward Cuba since the nineteenth century. My spoken Spanish links me to the madre patria of Spain, but I quickly inflected the mother tongue with a Caribbean accent and, Canadian dollars in hand (to avoid the 10% penalty levied on US dollars), passed as some hybrid (North) American. Vaya gringada. It’s a particularly potent time to reflect on what it means to be an American (read: citizen of the United States). The Cubans with whom I spoke were eager to talk about “Troomp” and seemed well aware of many aspects of American culture, knowledge gained through the weekly download of the underground el paquete, delivered by hand on a flash drive to anyone with the convertible pesos to pay for it. The guard in the museum of Cuban art asked me if we had paintings like the ones by Wifredo Lam in the United States, and she quickly moved to the question of how much my airline ticket cost, noting many Cubans would like to leave the country. I didn’t anticipate such openness to the United States. Yet the positive attitude makes sense, given the age of these Cubans (the revolution is all they’ve known) and the cultural influence of American media, consumer goods, and even food. Cubans talked to me with dismay (which I share) about the wall between Mexico and the United States that Trump has threatened to build and the ban against citizens from majority-Muslim nations. The Modern Language Association has communicated a collective sense of outrage against immigration policies that violate human dignity and opposed the drastic cuts in the 2018 federal budget that would eliminate funding for the National Endowment for the Humanities (NEH), the National Endowment for the Arts, and other cultural and educational programs. Cuba is a country in which prominent writers like Nicolás Guillén and Miguel Barnet have participated actively in the intellectual and political life of the nation. It is true that they must align themselves politically with the regime to play such a role, something that writers like Cabrera Infante ultimately refused to do. Yet, it should be noted, intellectual freedom in Cuba was a fraught issue long before the 1959 revolution; for example, the United States–backed dictator Gerardo Machado had the writer Alejo Carpentier arrested in 1927 for subversion and shut down the university in 1930 in the face of student protests. And what of the writers, historians, literary scholars, artists, poets, and other practitioners in the United States, with its vast material riches and tradition of infrequent government interference in cultural production, especially in the modern era? The United States government offers relatively little economic support to the humanities community. Less than 1/21,000th of the federal budget goes to fund the NEH annually, an amount that is barely more per capita than the cost of a postage stamp. The NEH might be seen as the forgotten research and education outreach institution in Washington: it represents less than one percent of the federal budget for scientific research and less than one tenth of one percent of the federal research-and-development budget. In the current political climate, in which public defunding and privatization are rapidly becoming the norm, the NEH, even costing the minuscule amount that it does, is endangered. The federal budget functions as a mechanism for setting policy, and by eliminating funding for the NEH, we as a nation would be saying that the humanities don’t rank at all among our priorities. This sorry state of affairs is certainly not as dire as government censorship and persecution of writers in Cuba like Reinaldo Arenas, but make no mistake: it constitutes neglect and ostracism of our intellectual heritage. It calls for “survival American,” a continual public discourse of resistance and opposition to the threats to our humanistic work that emanate from our government. In Cabrera Infante’s first novel, Tres tristes tigres, the interplay between Spanish and English constitutes a major component of the pleasure that the work offers to readers who know both Spanish and a fair amount of conversational English and American popular culture. In the section “Los visitantes,” the story of a cane is purportedly told and retold by Mr. and Mrs. Campbell, then corrected by Rine Leal. The mistranslations from English to Spanish and vice versa give the text its nonsensical quality, but the reader’s ability to read between languages rescues it from unintelligibility. Mrs. Campbell, on arriving in Havana for a weekend, supposedly observed to her husband, “¡Miel, éste es el Trópico!” (186). In Spanish, miel (“honey”) does not connote endearment, and the oral stress on the definite article, unlike in English, fails to transmit emphasis (the stress would fall on the noun) and thus sounds rather silly. I realized I was at moments seeing Havana through the language of Cabrera Infante. I observed myself as the American who, despite proficiency in the common Spanish language that allows me to travel to so many countries and be understood and despite having studied so much about Cuba for decades, knew so little on the ground that I might as well have uttered “¡Miel, éste es el Trópico!” myself. And that is because humanities learning always starts anew. Survival of the humanities requires continual personal, societal, and governmental commitment and investment. The America that makes me proud upholds and supports its writers, thinkers, artists, and creators, and it’s an America well worth fighting for. Cabrera Infante, Guillermo. Tres tristes tigres. Seix Barral, 1970. Read earlier columns in my “survival” series: “Survival Spanish” (Summer 2007), “‘Tan cerca de Dios’: Survival Poqomchi” (Spring 2008), “Return of the Pensative Daughter: Survival English” (Spring 2011), and “Tamales for Dollars: Survival Guatemalan” (Spring 2013). I write these words ten days after the forty-fifth president of the United States was inaugurated. The landscape for MLA advocacy has already registered the seismic shifts that the new administration set off when it issued executive orders to construct a physical wall between the United States and Mexico and to close United States borders to citizens of seven nations with majority Muslim populations, as well as when it threatened to eliminate the National Endowment for the Humanities and the National Endowment for the Arts. Many of you wonder what role your scholarly association should play in these times. We all realize that issuing MLA statements on what promises to be a flood of worthy causes could dilute the power of our collective voice and expend energies best directed toward other actions. At the same time, we recognize that silence can be interpreted as complacency, so as an association we commit to speaking out on those issues that intersect most directly with our professional interests. The MLA also joins with other scholarly associations in making statements that endorse or oppose particular causes (a recent case in point: the joint statement on threats to academic freedom and higher education in Turkey). The National Humanities Alliance (NHA). As a founding member of the NHA, the MLA has a central role in shaping the advocacy priorities of this Washington-based group. A coalition of more than 170 organizations and institutions, the NHA advocates for humanities education, research, preservation, and public programs. In addition to lobbying for humanities funding, the NHA works to advance policies that support the humanities, develops policy initiatives, and promotes public awareness of the humanities. MLA members can participate in the NHA’s National Humanities Advocacy Day and learn how to lobby effectively on Capitol Hill and in their districts. The Coalition for International Education (CIE). A coalition of over thirty higher education organizations, the CIE works to support programs, like Title VI and ­Fulbright-Hays, that promote greater awareness and understanding of the world’s languages and cultures. Through symposia, reports, videos, and other campaigns, the CIE educates policy makers, officials, and the media about the importance of United States global competence. The Joint National Committee for Languages and the National Council for Languages and International Studies (JNCL-NCLIS), a nonprofit education-policy organization with more than one hundred organizational members, works to “ensure that all Americans have the opportunity to learn and use English and at least one other language.” JNCL-NCLIS promotes awareness of language issues through its lobbying and publications and through events like the annual Language Advocacy Day and Delegate Assembly. The event draws language advocates who want to make the case for language education to Congress while learning more about programs and policy issues. The Conference of Executive Officers (CEO) of the American Council of Learned Societies brings together leaders from the council’s member societies to discuss issues that affect humanities research, teaching, and scholarly communication. The CEO collaborates on policy documents and public advocacy statements, such as the recent statements about the January 2017 executive order on immigration. In addition to participating in these organizations, the MLA frequently joins with other groups to speak out on specific issues. Recent MLA efforts include a briefing for congressional staffers on adjunct working conditions, led by the New Faculty Majority, and a panel at the Albert Shanker Institute on the emergence of the precariat. The MLA is often called on to participate in policy discussions at the highest level. The American Academy of Arts and Sciences asked me to serve on the Commission on Language Learning, which has just completed its work. One of the commission’s reports, The State of Languages in the U.S.: A Statistical Portrait, draws heavily on MLA research and analysis. I will be in Washington, DC, in late February, when members of the commission will present the report at a congressional briefing. To help members keep track of the association’s advocacy efforts and participate more fully, we will soon introduce an advocacy hub to our Web site. You expect the MLA to work hard to advocate on behalf of our common interests, and we commit to doing so with increased vigor in the months and years ahead. In a paper originally delivered at the MLA Annual Convention in 1977, the year I joined the association, Audre Lorde told us, “My silences had not protected me. Your silence will not protect you” (41). I carried a sign with that famous second sentence at the PEN America Writers Resist event at the New York Public Library this past January, and I thought about the connection between language and action. “For to survive in the mouth of this dragon we call america,” Lorde said, we must speak out and be seen. “And that visibility which makes us most vulnerable is that which also is the source of our greatest strength” (42). May we recommit to speaking, writing, and acting out, and may you find in the MLA a source of strength. Lorde, Audre. “The Transformation of Silence into Language and Action.” Sister Outsider: Essays and Speeches, Crossing Press, 2007, pp. 40–44. The State of Languages in the U.S.: A Statistical Portrait. American Academy of Arts and Sciences, 2016. The Executive Council has put a great deal of thought into the future of the association as we approach a transition to a new executive director. As many of you know, the executive director search committee expects to conclude its work by the end of the academic year. Because humanities professions are rapidly changing to adapt to shifts in higher education, the council has also been developing and refining an ambitious strategic plan to take the organization through 2020 and beyond (www.mla.org/Strategic-Planning). I hope you will look at the brief summary of the strategic plan we released at the start of the fall semester. We are working to build a flexible, responsive scholarly association for the future. This endeavor means broadening the range of members that we serve, creating new opportunities for members’ professional development, facilitating new connections between members and among their communities, and finding new ways to get members’ work out to the world. Yet all of that work requires investment, particularly in new technologies. Technological transformation is rarely straightforward and without complications, but we believe that investing in new technologies will enable the association to respond to developing member needs. The strategic plan will be a success if we sustain and support the vibrant intellectual communities within the MLA and create new ones beyond our current membership. We might say, borrowing from Teresa de Lauretis’s pioneering notion of the technologies of gender, that MLA intellectual communities are both the product and the process of technologies such as the material forms in which we disseminate and interpret scholarship and the institutional discourses that establish and subvert hierarchies. The council has studied the association’s practices and technologies with an eye toward aligning them with our changing mission. MLA members will undoubtedly be interested in what the strategic plan means as it applies to their research and teaching. By employing new technologies, the MLA will soon be able to do things like release individual chapters of Approaches to Teaching volumes for instructors preparing to teach only one short story of an author’s work. The strategic plan will also serve members’ professional lives and bolster the humanities. Technology will help the MLA create regional advocacy networks; provide departments with resources for helping PhDs discover a wide range of careers; and, yes, raise funds to support teachers, students, and programs. To make all this possible, we are launching a campaign, Paving the Way: For the Future of the Humanities, which you’ll hear more about at the convention in Philadelphia. In the meantime, I invite you to read the plan and offer feedback at strategicplan@mla.org. de Lauretis, Teresa. Technologies of Gender: Essays on Theory, Film, and Fiction. Indiana UP, 1987. As most of you already know, more and more departments are shifting their in-person first-round interviews for academic positions to videoconferencing platforms such as Skype.1 Yet candidates may still envision the MLA convention primarily as a job market, during which they interview, if they are fortunate, and attend ADE- and ADFL-sponsored demonstration interviews or sessions on graduate school life or the academic workforce. The faculty members who conduct interviews generally describe their convention experience as time spent in a hotel room with the same colleagues for long mornings and afternoons, leaving them few occasions to attend sessions, go to the exhibit hall, or participate in one of the MLA-sponsored cultural excursions. Not ideal for anyone, especially in a brutal humanities job market. When we surveyed members recently, we learned how they want the convention to change. Many said they would like to see even more opportunities for career development than already exist. As part of the MLA’s current strategic plan, that’s exactly the direction the convention has begun to take. We have started to expand the scope of offerings at the convention to reflect members’ burgeoning interest in new forms of career development. Of special interest in this regard are the sessions linked to Connected Academics, the MLA project, funded by the Andrew W. Mellon Foundation, to prepare humanists for a wide variety of careers. Workshops focus on transferable skills, writing for broader audiences, networking, and job-search strategies. For the second year, we are showcasing the diverse and rewarding careers of humanities PhD recipients. Attendees have an opportunity to discover the wide range of employment possibilities available within and beyond the academy. Presenters, available for one-on-one discussions about their jobs and the career paths that led to them, include PhDs who work in universities, secondary education, nonprofit fund-raising, finance, management consulting, public humanities, journalism, and public policy. For a complete list of convention sessions related to Connected Academics, see https://connect.mla.hcommons.org/2017-mla-convention-activities/. As we plan future conventions, we are thinking about the kinds of support that our members want across the arc of their careers. Graduate students may wish for information about building an online research profile or making connections with scholars in their fields. Early-career faculty members might seek guidance as they take on new responsibilities in student advising, personnel matters, or curricular development. Senior scholars seeking new career challenges might want to explore possibilities for moving into administration. Some members will want to focus on grant writing, journal editing, national humanities advocacy, or collective bargaining as developmental areas in which to engage. The convention will, of course, remain a site for scholarly exchange and informal networking, which have always been its heart and soul. Yet in expanding the range of professional opportunities at our annual meeting, we think more members will find attending the convention an even richer experience, one that might produce anything from discovering effective ways to restore shared governance to forging a new career path. If you have ideas for the kinds of professional-development workshops you’d like to see, please let us know by writing to execdirector@mla.org. I hope to welcome you to the 2017 convention in Philadelphia! Beth Seltzer, who holds a PhD in English from Temple University, is one of twenty PhD candidates and recent PhD recipients taking part in the inaugural year of the Connected Academics proseminar on careers in New York City. Connected Academics (connect.mla.hcommons.org) is an MLA initiative, funded by the Andrew W. Mellon Foundation, that addresses a concern raised by both the study of career outcomes of 2,200 language and literature PhDs and the Task Force on Doctoral Study: the need to prepare PhDs in language and literature for a range of careers. Proseminar fellows such as Seltzer are connecting with peers from eleven different academic institutions to learn how to apply their research and teaching credentials to articulate transferable skills, create a professional Web presence, and gain an understanding of the humanities workforce beyond the classroom. Perhaps the most distinctive aspect of Connected Academics is the opportunity to meet with humanities PhDs at the organizations where they work, such as the New York Public Library, Ithaka S+R, the American Council of Learned Societies, Bard High School Early College, and the Frick Collection. Connected Academics is about encouraging language and literature PhDs to recognize the fullest expression of their abilities and to realize that the humanities workforce is not limited to teaching. Seltzer emphasizes in her blog post that she prepared for and pursued multiple career options at once, including tenure-track teaching positions at postsecondary institutions. Indeed, she felt more prepared for the academic job market because of her varied professional experiences. In Seltzer’s case, the outcome of her job search was a full-time position at Bryn Mawr College as an educational technology specialist—a job that will draw heavily on the teaching and research skills she acquired while pursuing her PhD. Her year in the Connected Academics proseminar has made her aware of her capabilities and of the variety of organizations in which she could put them to use. Most graduate students today, including our proseminar fellows, look to their faculty advisers, chairs, and directors of graduate studies to help guide them on a career path. It’s understandable that those without experience in careers beyond the classroom have been hesitant to endorse students’ desires to explore a breadth of career options, yet those of us involved with Connected Academics believe that things will begin to change as our proseminar fellows share their confidence and enthusiasm with others at their home institutions. Our three partner institutions are exemplary in the adaptability and innovation they have shown in the face of the breadth of graduate student career ambitions. Georgetown University’s Reinvent the PhD project has, as one of its central goals, the creation of a Georgetown Center for the Public Humanities and a new, interdisciplinary doctoral program in the public humanities. Arizona State University is focusing on enriching the doctoral experience through the incorporation of additional skills—digital, quantitative, and entrepreneurial. Finally, the University of California Humanities Research Institute’s Humanists@Work program provides opportunities for graduate students to expand their professional experience through statewide workshops and paid summer internships. While participating in the Connected Academics proseminar has convinced participants of the value of their wide-ranging work, it is, of course, the MLA’s core belief that all labor should be fairly compensated. I want to emphasize here, as I have elsewhere, that we will continue to advocate better working conditions for adjuncts and for the creation of more tenure-track positions at universities. Yet the enthusiasm generated around the Connected Academics project demonstrates that our conversations on academic labor and post-PhD humanities work must become broader. The MLA is prepared to work with departments to help graduate students prepare for an expanded range of career opportunities. We owe the next generation of humanities scholars our support for their ambitions as they apply their humanities PhDs to a broad range of satisfying careers. I thank my colleagues Stacy Hartman and Nicky Agate for their assistance with this column. Just over five years ago, the world of higher education was shaken by the news of the planned elimination of programs in several languages and in theater at the University at Albany, State University of New York. Stories about other programs at risk followed, as did outcries from educators and the public. I wrote about the shortsightedness of such cuts in this publication and in the Chronicle of Higher Education. Five years later, few stories about closed or merged programs make the front page in the higher education press. But these programs remain at risk. Proposed cuts have been announced, for example, at Rider University (Clark), at the College of Saint Rose (Bump), and at Calvin College (Delph, Bosch, and Parks). On some campuses, no programs seem more vulnerable than those in languages other than English, and I’d like to tell you what the MLA has been doing to help. In 2010 a working group of the MLA’s Executive Council, under the leadership of 2009 MLA president Catherine Porter, began the project to develop what became the ADFL-MLA Language Consultancy Service (adfl.mla.org/Resources/Consultancy-Service). The service is designed to help members of the Association of Departments of Foreign Languages (ADFL) anticipate problems before they become critical. Typically, the service sends one faculty expert to visit the campus of a department requesting assistance. The consultant draws on MLA resources to provide information and advise the language program on a variety of issues (e.g., curriculum design, faculty governance, strategic planning). Consultants are faculty members with a wide range of experience in administration; many have served as program directors, chairs, and deans or held other positions in upper-level administration. During the 2014–15 academic year, faculty experts, identified and trained by the ADFL staff together with faculty members who have worked previously as consultants, visited an extraordinary variety of departments and programs ranging from small liberal arts colleges to large departments in R1 universities. The Language Consultancy Service has supported public, private, and faith-based institutions. Consultancies have been organized for single- and multilanguage departments as well as for general humanities departments that include languages at comprehensive public institutions. The consultant spends approximately a day with the department’s faculty members to discuss innovative educational trends and to address institution-specific concerns. The goal is to create ongoing and productive dialogue in the academic unit. Language Consultancy Service visits can provide effective preparation for an external review. Many departments have scheduled consultancy visits in connection with faculty retreats or with the first faculty meeting at the beginning of a new academic year. Financial support for the program is shared by the MLA and the institution requesting a consultation: the MLA pays the consultant’s honorarium, and the college or university covers the costs of travel and on-site expenses. The ADFL-MLA Consultancy Service provided our large and diverse academic unit with the valuable opportunity of having an independent and expert consultant assist us in exploring a wide range of short-term and long-range questions that impact our programs and students. During the visit, the consultant presented insightful data and feedback on the links between enrollments and curriculum, building majors and degree programs, recruitment, retention, careers, and post-degree pathways. Moreover, the consultancy service helped in the articulation of some overarching questions as “How to promote languages as areas of strategic emphasis?” and “How can a foreign language department make itself more vital to the University?” The visit enabled the consultant to meet not only with the general faculty but also with specific groups, including coordinators of the language sub-units and directors of language programs, all of which led to an informed and productive dialogue. Equally beneficial was the follow-up data supplied by the service that addressed specific questions, strategies, and program development and growth issues that emerged during the visit. In all, the information and discussions resulting from the visit contributed greatly in allowing us to have a much clearer focus in the development and implementation of a strategic plan. To date, the Language Consultancy Service has made twenty-seven site visits in twenty states, with at least ten more visits to come in 2016. The recommendations of the 2007 report of the Ad Hoc Committee on Foreign Languages, Foreign Languages and Higher Education: New Structures for a Changed World, which guided the creation of the consultancy, continue to function as a useful starting place for the conversation between the consultant and the department. The report proposes that all faculty members (full- and part-time) work together to structure curricular offerings so as to address a variety of needs that students experience today, recognizing that very few students will go on to graduate studies in literature. The report acknowledges the intrinsic value of language study but also argues for the necessity of thinking more about instrumental applications of language. In particular, the report challenges departments to confront and overcome curricular bifurcation along the all-too-­familiar split between language and literature. The report encourages a curricular design that emphasizes culture from the beginning (literary, filmic, popular, and so on) and language to the end (including graduate studies). A program built around such offerings is both pedagogically effective and has the potential to resist the division of the academic workforce into non-tenure-stream faculty members at one end of the curriculum and tenure-stream faculty members at the other. Rethinking the curriculum becomes an occasion to address labor practices and faculty governance in the department. And it becomes a chance to implement change where it is needed. I thank my colleagues Dennis Looney and Mara Naaman for their assistance with this column. Ad Hoc Committee on Foreign Languages. Foreign Languages and Higher Education: New Structures for a Changed World. Modern Language Association. MLA, 2007. Web. 31 Jan. 2016. <https://www.mla.org/New-Structures>. Bump, Bethany. “Saint Rose Cuts Twenty-Three Faculty Jobs, Slashes Academic Programs.” Times Union. Hearst, 11 Dec. 2015. Web. 31 Jan. 2016. <http://www.timesunion.com/local/article/Saint-Rose-cuts-23-faculty-jobs-slashes-academic-6692774.php>. Clark, Adam. “Rider University Slashing Thirteen Majors, Laying Off Professors.” NJ.com. New Jersey On-Line, 29 Oct. 2015. Web. 31 Jan. 2016. <www.nj.com/education/2015/10/rider_university_slashing_13_majors_laying_off_pro.html>. Delph, Anna, Katelyn Bosch, and Josh Parks. “Recommended Program Eliminations Initiate Discourse between Students, Alumni and Administration.” Calvin College Chimes. Calvin Coll., 1 Oct. 2015. Web. 31 Jan. 2016. <http://www.calvin.edu/chimes/2015/10/01/recommended-program-eliminations-­initiate-discourse-between-students-alumni-and-administration/>. Feal, Rosemary G. “The World beyond Reach.” The Chronicle of Higher Education. Chronicle of Higher Educ., 7 Nov. 2010. Web. 31 Jan. 2016. <http://chronicle.com/article/the-world-beyond-reach-why/125267/>. ———. “The World within Reach?” MLA Newsletter 42.4 (2010): 4–5. Pietralunga, Mark. Message to Dennis Looney. 21 Dec. 2015. ­E-mail. “Responses from the Academic Community.” Save Our SUNY. N.p., 2010. Web. 31 Jan. 2016. <https://saveoursuny.­wordpress.com/responses-from-the-academic-community/>. The blog features columns from the MLA Newsletter, resources on the academic workforce and graduate education, and posts about other items of interest to MLA members.